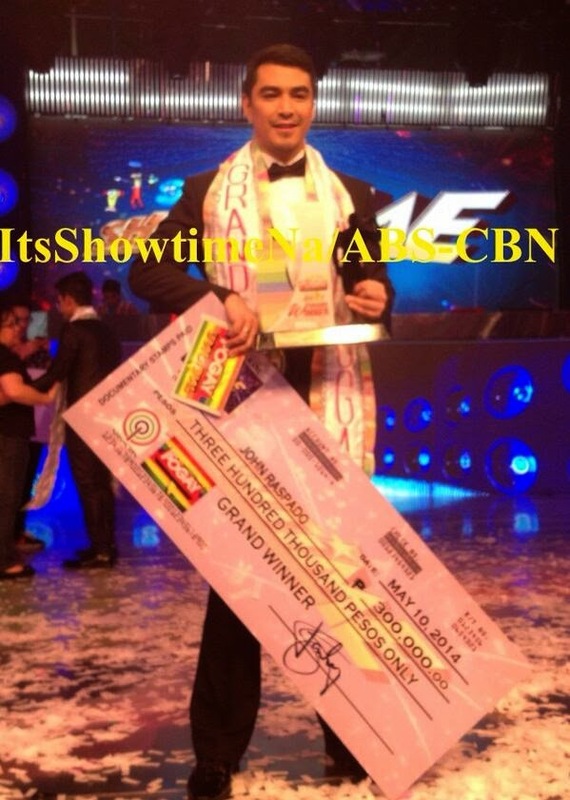 Manila, Philippines - John Raspado of Baguio City was named 'I Am Pogay' grand winner in the live telecast of ABS-CBN's noontime program It's Showtime on Saturday, May 10, 2014. Raspado received a cash prize of P300,000. Other confirmed winners of the Showtime's segment are: Christian Laxamana (1st Runner-Up); Oreo Gajasan (2nd Runner-Up) and Peter Sycris Brown and Ton Villaruel (3rd Runners-Up). Grand finalists Ton Villaruel and Bench Tinao received the Friendship "Beksfriend" Award and Best In Talent "Pamintalent" Award, respectively. Two more awards were given later on the show, the Best in Formal Wear "Kumu-Couture" Award to Peter Sycris Brown and Manly-looking "Bruskoday" Award to John Raspado. The top 10 for 'I Am Pogay' was selected after the deliberation done by judges Lani Misalucha, Richard Gomez, and host Jhong Hilario. The list includes Oreo Gajasan, John Raspado, Jay dela Cruz, Peter Sycris Brown, Christian Laxamana, Kris Alcantara, Ton Villaruel, Francis Tamo, AJ Fullido, and Von De Guzman. The grand finals on Saturday became an instant trending topic on Twitter with "#IAmPoGayGrandFinals" and "John Raspado" on the list of Philippine trends. "I Am Pogay" is the second LGBT-themed segment of "It's Showtime" after the highly successful "That's My Tomboy." Launched in October last year, the talent showcase for gay men who look masculine also includes a question-and-answer portion.